Jason recaps the events from Roll For Combat, Episode 015: Take It To The Bridge. What, oh what, should we talk about this week? Oh, right. That. I guess we finally identified the space equivalent of being unable to hit water falling out of a boat. I still think the general idea was a good one. The space dogs had taken a lot of damage, so it seemed like one lucky damage roll could’ve taken multiple enemies out. Meanwhile, Tuttle had only taken a few points of stamina damage, so even if the grenade hit for 5 or 6 damage, it wasn’t going to be a huge problem. And in one of life’s little ironies, I didn’t want to risk throwing the grenade and missing some of them. So I figured I’d take one for the team, but possibly have a little hero moment in the process. I did think about just holding the grenade in my hand, but I have to admit I was worried Steve might tack on extra damage – I was worried the difference between “near the blast” and “literally holding the thing in your hand” might have been an extra d6 of damage. Maybe I should’ve explicitly asked, but the flip side is that I didn’t want to put the idea in his head if it wasn’t already there. So I figured I could just drop it, and… yeah, natural 1. And that’s where we get into the theology portion of the discussion. Should I really have had to roll to literally drop something at my feet? I have to admit that my initial reaction was that Steve was being a little unfair. I mean… come on. It’s literally opening your hand and dropping something. How hard is that? If you drop a weapon in the middle of a fight to switch weapons, you don’t have to roll to see if the gun goes off. And let me be honest – I wasn’t totally sold by the “risk/reward” argument Steve was offering. I know the argument – if there’s a chance of a critical hit, there should be a chance of a critical fail… and OK, that makes some logical sense. But the flip side is: I associate combat rolls with something that requires extraordinary effort, and the possibility of a crit doesn’t make the action inherently difficult. And the “risk” Tuttle was assuming was that if the grenade DID score a crit, Tuttle would be caught in it too. On the other hand (mentally, I always say this as Tevye from Fiddler On The Roof), the more compelling argument is to break down what a round of combat actually represents. It’s six seconds, and even though it’s taken in turns to make the game flow smoothly, the actual actions are happening semi-contemporaneously. So yeah, I can drop something… but that’s the first half-second. What happens in the other 5.5 seconds, while the the akatas and the other players are taking their turns and moving around? It’s not that hard to “what-if” something that fits – Tuttle drops the grenade, but one of the dogs makes an aggressive move that startles Tuttle; he tries to move out of the way and accidentally kicks the grenade back down the hall. Also? Weird, fluky stuff happens in real life. If there can be YouTube videos of people flipping water bottles and landing them perfectly on tables, I guess you can drop a grenade and kick it backwards into your own team. I grant it doesn’t happen often – maybe 5% is too high, and I should’ve lobbied for a roll to confirm the critical fail – but it does happen. Besides, at the end of the day, we survived, and it was a fun story moment. If someone had died, I might have been singing a different tune. Speaking of dying, the other major event was saying farewell to CHDRR 2.0. I have to admit losing CHDRR is easier the second time around. The first time, I was legitimately bummed out; this time, I’m starting to reach a comfort level with the idea that drones sometimes have to eat it for the greater good. That doesn’t mean I want to be careless with CHDRR 3 and beyond – I’ve become attached to the little guy. But if you look at the situation, there really wasn’t any other call – Mo was starting to take a lot of damage, CHDRR was the one party member who couldn’t get space rabies, so it was in all of our best interests to let CHDRR hang in there and take as many hits as possible. What are you gonna do? I just hope we’ll get an opportunity to rebuild him soon – I don’t relish the idea of tackling too many fights without him. On the other hand, once we reach the bridge, we seem to be at a lull in the story anyway, so maybe it won’t be a problem. 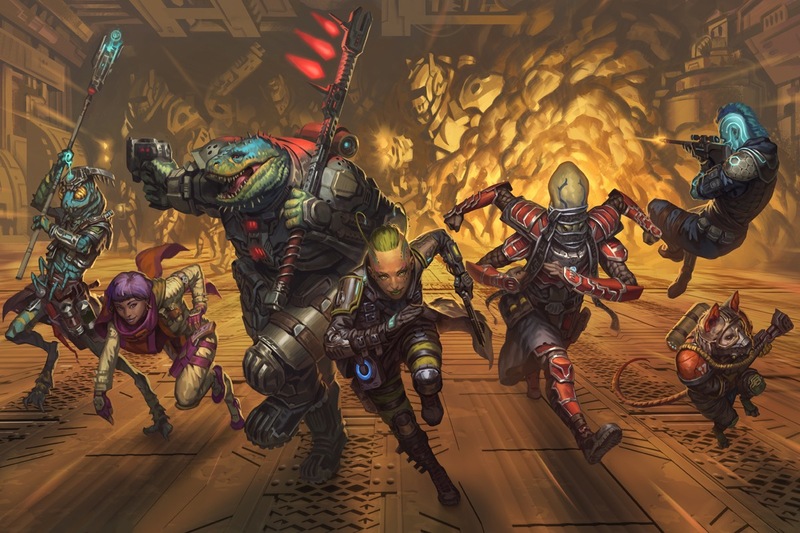 Yeah, we’ve got the goblins to deal with, but unless there have been remarkable advancements in goblin physiology since the Starfinder days, I have to think we can handle them even without CHDRR. Now that the ship is clear, do we go back to Absalom? Go somewhere else? I suspect the computer holds the clues, but it’ll take some better rolls to figure it out. There’s already a lively discussion afoot on Discord about Tuttle’s defeat at the hands of… well… gravity, but if you’d like to talk about that or anything else in the episode, feel free to drop us a line. Next week, hopefully, we can crack the ship’s computer and figure out what to do about our uninvited guests.